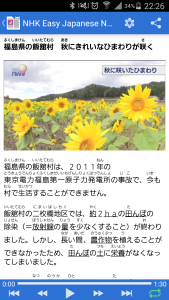 This app lets you read and listen to daily news provided by NHK NEWS WEB EASY in a very simple Japanese. It also show the reading (furigana) of Kanji as well as contains a list of new words with meanings in each news. With this app you can adjust font size for reading and setting to automatically play next/previous news when finish listening to once. Leave your comments and we will bring more convenience!!! 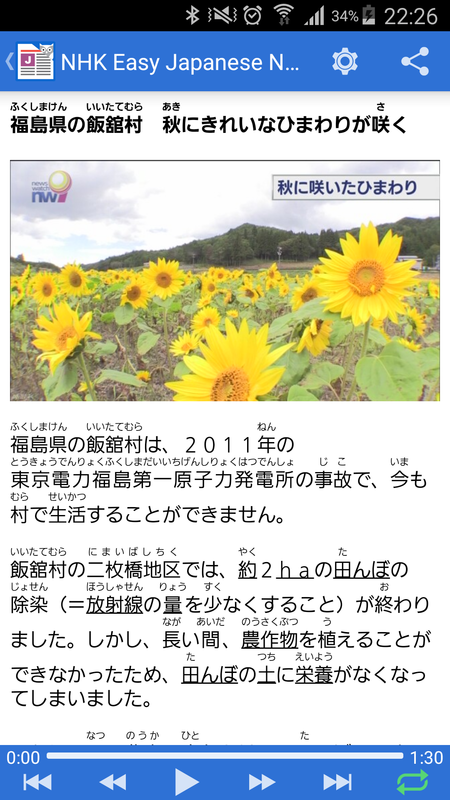 This entry was posted in Languages and tagged Easy, furigana, Jananese, listening, news, NHK, Simple, study. Bookmark the permalink. When will your apps be available in for iPhone? Thank you very much! Sorry for the lately reply. We are still working on the iOS version. Please let us inform you one we release. what does that “checkered” flag mean? That flag is to view the news in normal version, which mean more difficult Japanese version.